South Korea's space agency has announced it will attempt tofly its first satellite launcher next week, pending final reviews and tests. If successful, the milestone flight wouldput South Korea in an elite club of spacefaring nations with a domestic orbitallaunch capability. 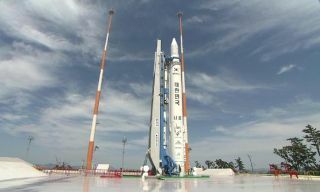 The newrocket, made from Russian and South Korean parts, could lift off as soon asAug. 11 from the new Naro Space Center at the southern tip of the Koreanpeninsula, about 300 miles south of Seoul. Engineers plan to move the 108-foot-tall rocket to thelaunch pad about two days prior to liftoff, where the vehicle will be liftedvertically by an erector system. A practice countdown is on tap the day before launch,according to SouthKorean news reports. The rocket can take off between Aug. 11 and Aug. 18,officials said. Officials will try to orbit a 219-pound technologydemonstration satellite using the new hybrid booster, which is called the KoreaSpace Launch Vehicle 1. The KSLV 1 uses a first stage developed by Moscow-basedKhrunichev, the builder of Russia's Proton rocket. The kerosene-fueled stage was developed for Russia'snext-generation Angarabooster, a modular design engineers hope will haul small, medium-sized, andheavy satellites into orbit. But Angara's development has been stymied by a series ofdelays, and the first stage of the new rocket will make its maiden flight fromSouth Korea. Propelled by an RD-191 main engine, the first stage willproduce about 430,000 pounds of sea level thrust at liftoff. Launch was delayed from July 30 to give Khrunichev engineersmore time to complete testing on the new rocket. Officially named the AngaraUniversal Rocket Module, the first stage was test fired last Thursday at thecompany's development center near Moscow. South Korea began working on the new rocket in 2002 andoriginally hoped to launch the booster in 2005. After early development trouble, Khrunichev signed on to theKSLV 1 project in 2004, spearheading the first stage and construction of theNaro launch site in Jeolladam-do province in the southwestern part of thecountry. The rocket's design and construction has cost about $400million, according to Korean officials. The Korea Aerospace Research Institute provided a smallsolid-fueled second stage to inject payloads into orbit.